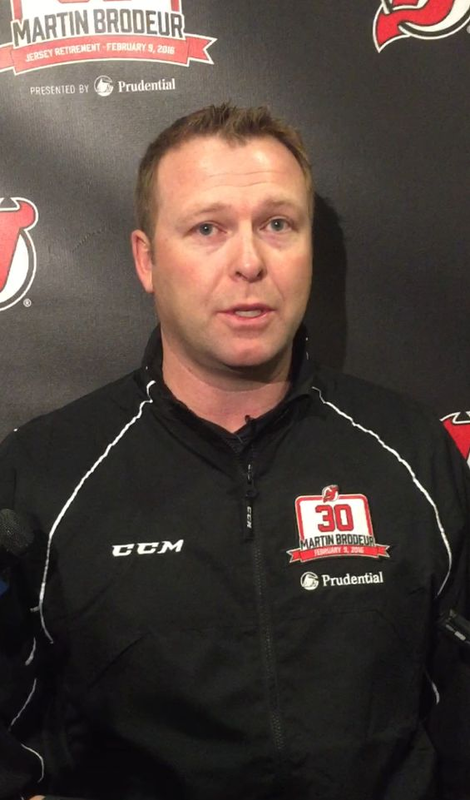 The New Jersey Devils’ celebration of the great Martin Brodeur culminated last night when his number was officially retired and raised to the rafters of the Prudential Center. The long weekend began with a Jr. Hockey Clinic Saturday morning where Marty coached and spoke to 40 youth hockey players. Below are the future Hall of Famer’s thoughts on youth hockey, sport specialization and the feeling of hoisting the Stanley Cup. Stay logged onto Youth1.com for Part II of this special Y1 on 1 coming tomorrow. Did you specialize in hockey right away or did you play other sports? When I was your age, I played a lot of sports. Hockey was during the school year. I loved playing baseball. My brother was a big baseball player and also golf, but I played hockey September through March. I became serious with hockey at 16 years old. I wanted to learn as many sports as possible, both individual and team sports. What do you think a parent’s role should be in their child’s athletic career? My parents never forced me into playing hockey or any playing any sport… I think it’s all about the sport and making sure that you’re there for your children. Parents should support their kids as much as possible. The biggest thing is to make sure you’re there for your children. What was it like working with the young players at the clinic? I've done it so much with my own kids. Two of them were goalies. Just to see their faces, I know it's a different generation. I don't know how much they know about me, but I'm sure their parents know. It's always fun to be around the kids. They were a little shy. I would be, too. How has youth hockey as a whole changed since you were growing up? Well I think there’s a lot more emphasis on the parents, wanting their kids to do well and pushing them to the limit. If it’s good or bad, I don’t know. For me especially, youth hockey, I think there should be limits on how much you can do in the calendar year and have the kids do other sports. As a parent, you should embrace that and I don’t know if they all do. If there’s any advice from me for any parents, try to get your kids into as many sports as you can so they can develop as athletes and not just hockey players. Do you have a story when you might have gone through hard times or was struggling and wanted to quit? How did you stay so healthy over your career? I practiced and I played a certain way that kept my body really limber and that’s probably why I never got hurt. Every time I was in a practice or a game I did the same thing over and over, I worked really hard. I got banged up, there’s no doubt about that, there’s a lot of playoff games and regular season games that I couldn’t believe I played, but that’s just the way it is. You play hockey and you just don’t want to let go. I didn’t want anyone to play; I just wanted to play every single game. Can you tell us about the experience of getting your hands on the Stanley Cup? What does it mean to get a statue in your honor? Well that’s probably the biggest surprise about the whole thing, not that I didn’t expect my jersey to be retired, but eventually with the success that our team got and that I got, you know I thought it was going to happen eventually, not that quickly, but it did. The statue, I didn’t see that one coming. You go to different rinks you see some athletes that are iconic to the area that they performed in and I’m really flattered. It’s a great honor for me to be part of that knowing that everyone that’s going to come through the Prudential center will take a look. What does this celebratory weekend mean to you? Well it means a lot…I’m excited about it, I cant say it brings closure, I’m in a happy place about what I’m doing, but I think this side of my career, my playing career, it’s a great honor. When you start playing hockey you don’t expect things like this, so for me to get recognized like that is pretty special not just for me but for my family also. Check back to Youth1.com tomorrow for Part II of this special Y1 On One.